I made these yesterday and they were lip smacking good. I gave away some to my landlady and her family and kept some for ourselves. As usual, Aaron's first question was 'Honey, you think you can just make the pastry case by itself? It taste really good, like butter cookies!'. This is awesome for kids party or as finger food. Mine were so tiny I could pop one whole tart in my mouth and still have room to munch. You think this one makes a lot, hell no! 45 tartlets are nothing really. Since Christmas is around the corner, I strongly suggest you make these for diner parties. Simple reasons because you'll be so busy and you probably want something easy to impress and to prepare of course! You can make the crema first and chill it overnight and make the tart cases on another day. When you wanna serve them, just simply dollop over the crema to give it the old-fashioned look. Top with some diced fruits and you're good to go. In fact, you can even not dice fruit and use whole fruits like blueberry, grapes, blackberries and raspberries. Here, I've used diced mango, pomegranate seeds, baby grapes, blueberries and strawberries. I managed to bought some really cute looking grapes. They are super cute, I tell you! The whole cluster, not just one or two of them are all mini baby grapes. Really can't explain, you gotta encounter and see it for yosuelf to believe it! I adapted the recipe from Tessa Kiros cookbook and no, I'm not posting up the recipe this time unless some of you all really want it. Because it's so simple, just use any tart case recipe and fill it up with your favourite recipe of homemade custard. Don't know which tart recipe to use? Try this, this or this, all tested by truly yours! And custard recipe, try this by Stephie. It's really all about experimenting sometimes and I just wanna share the technique and presentation here. You really don't need to make a lot of custard because they each only hold more or less a teaspoon or so. If you did make extra, use them to fill up cream puffs. I might be making some since I have leftovers so stay tuned! This mango tartlet is Aaron's favorite's. What's yours? Mine is the blueberry tartlet. It is not often that Australia blueberry taste like blueberry. You really gotta be here to understand why. Anncoo, sorry for the long delay. 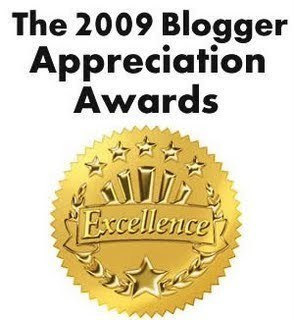 I've finally picked up your Appreciation Award for my excellence. If you're reading this, a million thanks to you again for thinking I'm worth it! 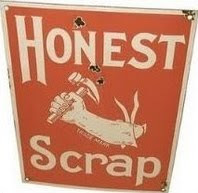 And Kitty, this Honest Scrap award of yours is ever longer! I'm sorry but I guess I'm very much like you, hehe! And I'm glad you find me encouraging, inspiring and brilliant! So thank you to you both! 4 comments on "Tiny sweet tartlets with crema and fruit"
These mini tarts look really super cute. I'll add this in my to do list. they look so cute! I would love to bite into thesee..
Anncoo: Add to to-do-lost please, they are delicious! Tracie: These little morsels are rather addictive. I kept popping one after another! Zurin: I love homemade good, rich custard too! Gotta make some again very soon!